Why do we use animations? Press the button if you liked the video! Thank you! We’ve recently had the privilege to help create a short advert for Superbook Season 1 Church edition featuring leaders and children from our local church (Gateway Church Ashford). Watch the short clip to learn more about this exciting new series! Are you involved in Children’s ministry and look for a fun way to engage kids with the stories of the Bible? Then the new Superbook Church Edition is the solution for you. Superbook Seasion 1 Church edition comes with all the tools you need to teach children about biblical heroes from Genesis to Revelation. Call CBN Europe now on +44 (0) 800 432 0700 to get your very own package. Season 1 includes all 13 Superbook adventures. With each DVD you receive comprehensive tools and a teaching guide, practical illustrations and lots of exciting activities that children can take home. 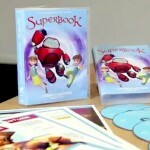 You can also order online at www.superbook.tv and select church edition at the top of your browser. Encourage children to continue their journey through the Bible and join Superbook.TV with their family and friends. Hope Animation is a collaborative project of Christian animators, programmers and designers who want to spread the message and teachings of Jesus Christ and the Bible through the use of new media, digital arts, computer games and animation. We currently finance the creation of our Christian Animations and Christian Computer Games mainly through our day jobs but hope to eventually be able to create Christian Media Resources full-time! Please let us know if you want to get involved or would like to support us in some way! Get a copy of one of our products in our shop!